When receiving Still Having Fun as my latest Military Writers Society of America’s review assignment, I was excited because I had actually met the author, Candace George Thompson, at the MWSA conference in Dayton, Ohio. I also enjoy reading biographies and memoirs, so it seemed a perfect fit. I imagined I’d be reading a sweet story about a family and would be “just getting to know” Rex and Bettie George and their family. Still Having Fun is more than that, however, true, it is a book about the lives of the George family, but it also brings us into the world during the 1940s and brings us up to the year 2007. My first thought was that this book might just prove interesting to people who know the George family, but this proved not to be true. Still Having Fun proved to be a very enjoyable, entertaining, and enlightening book. The letters that are included in the book bring the reader right into the family and make the story “oh-so-real.” The great thing that Author Thompson does is put her family story “into” the larger story of the world’s happenings during those times. Learning about some of the history of the Air Force is a plus to this book. The photos truly are a special addition, which helps the reader to connect to the George family. When I finished the book, I felt as if I had traveled back in time and experienced the ups and downs shared within the book. I learned more about the world before I was around to experience it myself, and related to the times that I lived through, but Still Having Fun, opened my eyes to what other families, namely our military families dealt with, while I was enjoying my stable life not having to move from place to place. The tenderness of Rex George as he dealt with Bettie’s Alzheimer’s reminded me of what my mother lived through during the last years of my father’s life. Books that can take us through so much historically and emotionally deserve the accolades that Still Having Fun is receiving. Thank you, Candace George Thompson, for sharing your family’s story. 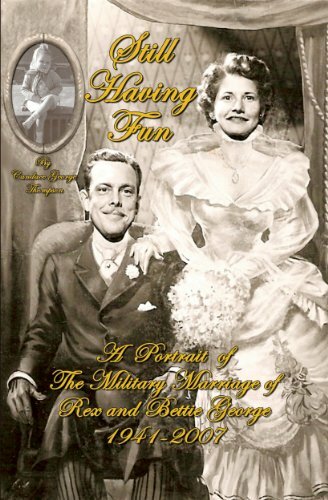 This remarkable biography of a military marriage which lasted from 1941 until 2007 includes everything from letters written in war zones to photographs that chronicle the lives and romance of Rex and Bettie George. Written by their daughter, Candace George Thompson, after their deaths, "Still Having Fun" is a moving testament to the character and resilience of American military families.